The Qadiani-branch of Ahmadi’s Claim That Court In Malaysia Declared Them As Muslims, When In Fact They Said To Court: We Are Non-Muslims! A few days ago on 6th July 2018, Qadiani-Ahmadi’s are claiming that a court in Malaysia has declared them as Muslim. See, for example, the facebook page Faizan e Ahmadiyyat. “”Thirty-nine members of the sect had challenged JAIS [Selangor Islamic Religious Department] for trying to charge them with shariah offences, on the basis that Islamic authorities in Selangor do not recognise Ahmadiah Muslims as Muslims. So what happened was that the Qadiani-Ahmadi’s went to court against the Selangor Islamic authorities saying: You can’t charge us with committing offences against Islamic Shariah because you consider us as non-Muslims. Ahmadiyya INC is a dangerous organization like the Jehova Witnesses. Just like the JW’s, Ahmadiyya purposely and willfully mis-translate and mis-interpret their scripture, i.e. the Quran. The first Ahmadi to write an Urdu translation of the Quran was the famous Ahmadi-apostate, Dr. Khan. He also wrote an english translation of the Quran in 1905. Since Dr. Khan left Ahmadiyya in 1906, his Tafsir was thrown out, thus, Ahmadiyya leadership had to write another official translation and commentary. When the split happened, the famous Lahori-Ahmadi, Muhammad Ali was already working on an Urdu and English full commentary on the Quran. However, by 1914, it wasn’t officially done yet. He ended up finishing his commentary and getting it published in 1917. Mirza Basheer-uddin Mahmud Ahmad, who was the Qadiani Khalifa at the time threatened to sue the Lahori-Ahmadi’s over the matter, and claimed that all of the commentary work that Muhammad Ali had performed actually belonged to him. Khwaja Kamaluddin wrote a book about this in 1915. Ahmadiyya strategy has always been to flood the world with their literature and thus get converts. Their main way of doing this was by publishing their Quran’s and then getting libraries to carry them. What is in these quran’s? Ahmadi’s want the world to believe that Esa (As) is dead…and this is their main strategy, if they could, they would burn all the quranic commentaries which imply that Esa (As) hasn’t died yet and thus kill this historical fact within Islam. These Quran’s contain many other Ahmadiyya ideas, like the continuation of prophethood and etc etc etc. My team and I have found an interesting speech/lecture by Dr. Gerdien Jonker, Ph.D on the Lahori and Qadiani missions in Germany and other parts of Europe, she focuses on Germany and the Lahori-Ahmadis a bit more then their Qadiani counterparts. Ahmadi’s are always crying that they get called Qadianis and this and that. They are taught to play the persecution card to the public. However, they were only called Qadianis since there were initially two main groups of Ahmadis, the Lahoris and the Qadianis. But Ahmadiyya leadership won’t stop, they continue to cry about persecution that isn’t even really happening, Ahmadis enjoy good jobs in Pakistan and blend in with the Desi environment. It is only when Ahmadi’s break the law and start giving out literature, that’s when being an Ahmadi in Pakistan becomes an issue. In the video in the below, the Ahmadi-mullah, Azhar Haneef, explains how he was invited to a Lahori-Jalsa in the country of Suriname in 2015 and he was shocked to see the slow death of the Lahori-Ahmadis. He commented how NO ONE shows up for Salaat and etc. However, he forgets to mention that any Ahmadi mosque in the USA, there are barely 2-3 people that show up for Isha on a Monday night. The truth is that the Lahori-Ahmadis are vanishing fast, most likely because of their liberal version of Islam, plus, they don’t worship the Mirza family like the Qadianis, and thus they aren’t brainwashed fools. They are free to live. Lahori-Ahmadis are the better version of Ahmadiyya, they realized that MGA and his family were corrupt, as early as 1909 and were trying to stop the Mirza family from turning Ahmadiyya into a family business, however, they failed. The real reason that Azhar Haneef was making these comments is because he was at the West Coast Jalsa Salana, and the young-american-born-Ahmadis (qadianis) are also vanishing and not just America, in Canada, Germany, the UK and other places in the west. They are leaving Ahmadiyya silently, just like the Lahori-Ahmadis. Azhar Haneef was commenting on this topic, he was urging young Qadiani-Ahmadis to worship their Khalifa, and thus remain hooked into Ahmadiyya. However, the truth is, young-american-born-qadiani-ahmadis don’t care about any Khalifa, they are modernized and utilize critical thinking, and thus are leaving ahmadiyya fast. Without immigration, Ahmadiyya in the west is dead. It is the immigrant Ahmadis, the asylum cases, they are the people who drive the jamaat, they are the ones who pay the chanda and force their kids to attend silly jamaat events and etc. It is the immigrant Ahmadi’s who work day and night on behalf of the Mirza family aka Khilafat. 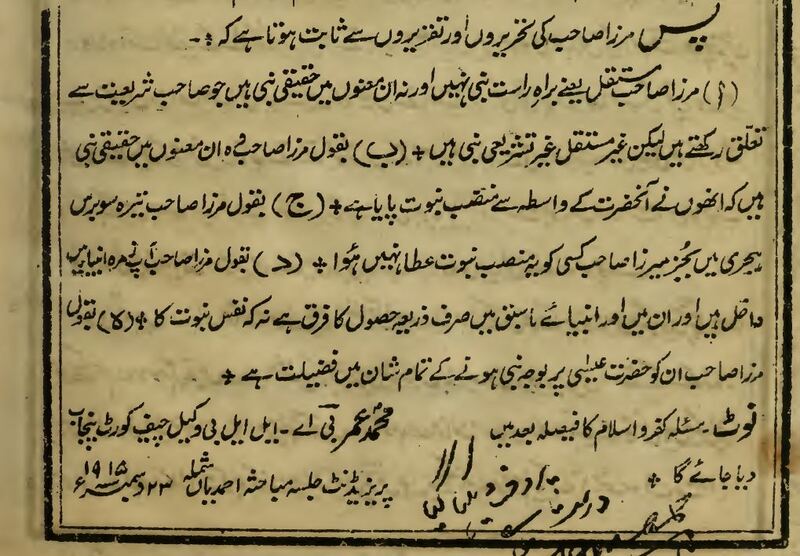 It is important to note that in terms of persecution, the Qadianis have hated their Lahori brethren for over 100 years, they even called them by many disrespectful epithets like “Paghamis” and etc. In fact, in 1916, Mirza Bashir Ahmad indirectly called them Kafirs as he declared that any Muslim who rejects the prophethood of MGA was a Kafir. I left Ahmadiyya mainly because of what I read about the Lahori-Qadiani split in the Ahmadiyya movement. I was disgusted by the behaviors of the Mirza family. In my research, I found an old debate by these two groups in 1915 and published in 1916. In this debate each party put forward its arguments before an impartial, non-Ahmadi Muslim arbitrator as to its interpretation of the claims of Mirza Ghulam Ahmad. The arbitrator’s verdict, printed in this book, is presented to show that he ruled that the Qadiani explanation of his claim, that he claimed to be a prophet, was correct. This debate is the definitive reference on what the Qadiani group of the Ahmadiyya think about Mirza Ghulam Ahmad as a prophet, and how the Lahori groups deflect the issue. This debate on the innovative and complicated theology of the Ahmadiyya groups was conducted at a conference held in Shimla that was called by the Ahmadis of Shimla. Shimla being a rich resort, these Ahmadis invited both parties and appointed Shaikh Muhammad Umar BA, LLB, as the arbitrator. The debate took place on 23rd December 1915 and was published in Qadian as Qaul Faisal, Mubahatha Shimla (8.5MB PDF) on 4 June 1916. These proceedings represents the closest we will get to the original positions and it includes many very interesting references and interpretations. Mirza Sahib is not a permanent (i.e. direct) prophet, nor is he a real prophet in the sense related to being legislative, but he is a indirect non-legislative prophet. According to Mirza Sahib, he is a real prophet in the sense that he attained the office of prophet via Muhammad (saw). According to Mirza Sahib, no other person has been bestowed this office in 1300 years Hijri. According to Mirza Sahib, he is entered into the group of prophets and between him and past prophets, the only difference is the means by which he became prophet, and not in the essence of being a prophet. According to Mirza Sahib, as he himself is a prophet, he has superiority, with all aspects of glory, over Jesus (as). Although the Lahori group has never been vocal about this debate, after this article was published, Dr. Zahid Aziz has written a defense of the verdict against the Lahori group on the Lahore Ahmadiyya Web site, available at http://www.ahmadiyya.org/qadis/shimla-debate.htm. None of the three points he raises — deferred matter of takfeer, Qadiani debater becoming Lahori, and Qadianis retracting their beliefs — is a rebuttal. As we wrote above about the Lahori position, the article is indeed a deflection. Dr. Aziz’s point is valid that the Lahori doctrine has been consistent. This is so because it was explicitly engineered by M. Ali and K. Kamaluddin as to not offend Muslims and try to stay within the realm of Islam. During the British raj, the Qadianis went full-bore with Mirza Ghulam Ahmad’s claims of being a prophet, and then they have had to retract or back-pedal their views in the face of Muslim opprobrium. There are two distinct phases of Mirza’s prophetic career: before 1901 and after 1901. Right in that year when the Mirza staked his claim to being a prophet, two of his stalwart followers, Ahsan Amrohi and Abdul Karim Sialkoti publicly argued about the matter. Hence, the Lahori view that there was no change at all is contrived. And that is exactly the point that makes this debate, held within a year of the Split, so important.